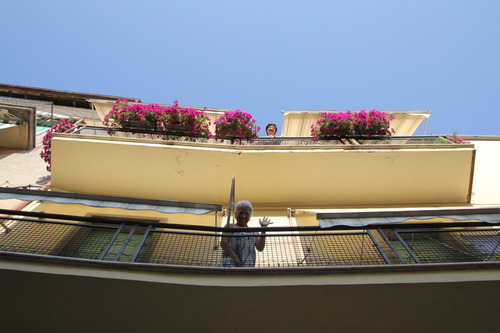 Last year’s apartment was next to a very friendly older woman (who spoke no English) with whom we would chat, balcony to balcony during our cocktail hour. She was very warm and interested in us, and in Fred’s art. Her friend lived just above, and would sometimes pop out on her balcony. The two of them would exchange things (cup of sugar, for example) using a long pole with a hook on the end (used to pull out canopies to protect the balconies from the sun) with a mesh basket on the end. 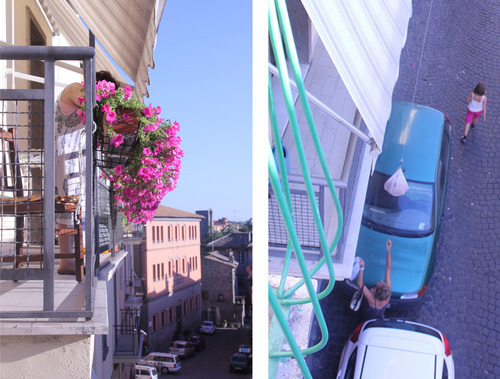 This is how we passed Fred’s Viterbo art book across from our balcony to hers. Here are two shots showing one of the women passing the bag all the way down to a friend on the street. This year, Fred and I took a walk over to the old apartment to buy wine from the shop on the ground level of the building. As soon as we turned the corner, guess who greeted us. Good to be back.